This GI Joe cake was inspired by other cakes I saw online, I went with a GI Joe cannon! For the cake itself I used a standard cake pan for the base, for the upper deck I filled a loaf pan with cake mix. I also baked a few cupcakes and cut the top off of one to make the hatch. Next step...frosting (allow 2 hours to decorate, maybe less for those of you who don't have OCD)! I picked up a moss green and a brown color to tint my frosting for the camouflage, applied the frosting using a spoon and butter knife. To create the wheels I found some cool wheel-like cookies at Target and for the cannon I used a Pirouette. To complete the design I cut a GI Joe tag off from the action figure container and placed a couple of guys and guns on the cake, created the lines for the tread and placed the big #7 in the hatch. It was HUGE hit!! 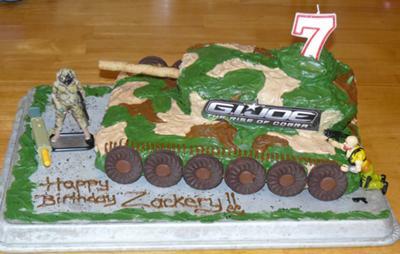 Happy 7th Birthday Zackery!! I love it! And love the comment about OCD too! Ha!